Some of you guys may know that one of my favorite crafting techniques is printing on Fabric! I love how professional the fabric looks when the images are printed directly on it…the quality is truly amazing! Even though it’s super easy to do, you can’t just pop the fabric right into your printer, you will need to stabilize the fabric or it will jam your printer. I’ve shared several different methods on my blog and I decided to round them all up in one place, I’m also including some links to a couple of my friends blogs, who also have fabric printing techniques and I’ll include a bonus tip at the end that you won’t want to miss! 1) Spray Adhesive Method This is a tutorial that my pal Gina Luker wrote here on my site. It’s a fun and quick method that only requires a few supplies. 2) Freezer Paper Method This is a post that I wrote recently. I believe this technique is probably the least expensive method, providing that you can find Freezer Paper where you live. It’s readily available in the U.S., but not so easy to find in some international countries. 3) Label Method This is the method that I use most often, because it’s the fastest! 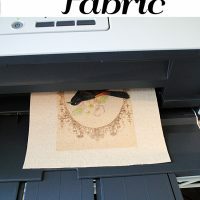 This tutorial was written by Gail from My Repurposed Life, she has lots of clear photos so you can really see how nice the printing looks on the fabric! 4) Printable Fabric Sheets This is a great method to start with, especially if you are nervous about putting things in your printer, other than paper. This is a fool proof, no worry product and there is a project and printable included on the post. 5) Photo Fabric Printing Solution For this technique my friend Beckie, from Infarrantly Creative, shows you how to make a homemade solution to apply to your fabric, before printing it. I have not tried this technique myself, but it looks like it’s an optimal method when printing Photographs on fabric. 6) Professional Printing with Spoonflower Ok, you can’t actually use your home printer for this one but, if you haven’t discovered this site before, it’s really cool! This one is the most expensive, it’s a company that prints the fabric for you. You just upload your design, choose your fabric and they mail it to you! What’s great about this is, you can print much larger sizes, since they can print on a whole yard. So you can cover chair seats or make huge pillows, something that you can’t do with an 8 1/2″ by 11″ piece of fabric. (Although you could always sew that smaller piece of fabric to a larger one, but that might not always be the look that you want.) I have tried this service myself, with great results! 7) How to Set your Ink This is a bonus tip from Gina. In this tutorial she shows you a cheap and easy way to set your ink, in case the ink you use is not waterproof. My inkjet printer uses waterproof ink, so I’ve never tried this personally, but Gina swears by it! She also shows you how to make a cute pillow in the same post! 8) How to get Good Quality Prints from your Home Printer Another Bonus Tip! This one goes over things like Print Settings, Choosing a Printer and more that you might find handy. Just so you know, I believe all of these were done with inkjet printers. 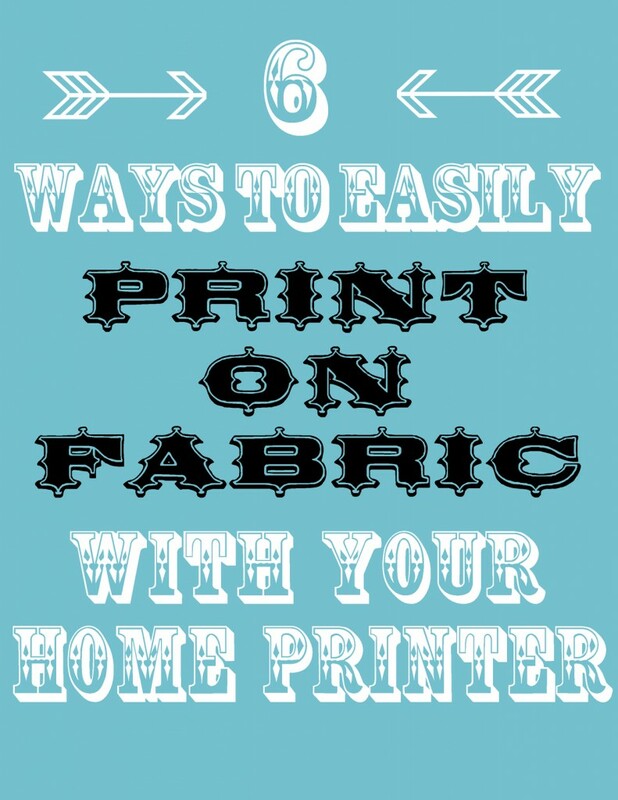 I hope you enjoy these fun tutorials for printing on fabric! Want to know How to Print on Other Stuff? Be sure and check out How to Print on Tissue Paper HERE and How To Print on Brown Paper Bags HERE. Thanks for all the great links. I have never tried printing on fabric myself but it looks so good when I see it done. Maybe now is the time to get some fabric out and give this technique a whirl! Cheers! Thanks so much for linking to My Repurposed Life in this roundup! I noticed some extra visits, so I thought I’d pop over to see why. 🙂 you rock! heres a 7th way: use an 8.5 x11 piece of card stock, run double sided tape around the edges, stick you fabric to it and run it theu the copier. works for me eveytime! Thanks for the wonderful links. 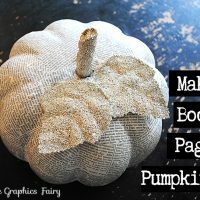 I found you on the craft Gossip website and I can’t wait to try some of these ideas out. Love these methods! I really enjoy using Spoonflower. They are the”go-to” for professional fabric printing and they are reasonably affordable. Has anyone ever tried spraying fabric with fabric stiffener and putting it through a printer? I wonder if that would work. I can not wait to try some of these methods out!! Can you please tell me what kind of printer you use that has permanent ink? I tried the vinegar method and all the ink ran and what was left turned from red to brown. I purchased a Canon printer specifically for printing on fabric and didn’t know about the ink being water based and not permanent. I will have to return it and get another one and I would like it to use pigment ink or permanent ink. Thanks so much! Hi Pam, I use an Epson. Many of the Epsons use Pigment ink, but not all of them, so you will need to check with the salesperson to make sure. If you click on the “FAQ” link at the bottom of this post, you can read more about my printer. Thanks so much Karen for the information! It appears that the WF 1100 has been discontinued and replaced with the WF 7010 which is out of stock everywhere 🙁 I will keep researching but will definitely buy some kind of Epson. I have wracked my brain trying to find the post you had a few days ago about the free program you can download to print the graphics as large as you want using multiple sheets of paper. This may not be the place to request this but if anyone can help, I would appreciate it. I just love your blog and the links to the talented and creative people that share my passion. Thank you a thousand times over for posting these beautiful images each day. Im trying to make a sleeve for my iPad 3 with a logo I made in Photoshop. Which method would work the best? Is there a certain fabric I should use for the label method??? I use Cotton usually Lindy! Hi once again I’m amazed at how much information I can find on your site! Every Friday when I get your much anticipated email I find so much wonderful info. and ideas! Today I found much needed info. on a great crafting printer! Using pigment inks, and Matt photo papers, I just love your site, it’s filled with everything a paper crafter needs, and the images are so fantastic! Thank you for such a fun filled site! So excited to find this!!! I followed the link to the label method – and it worked! 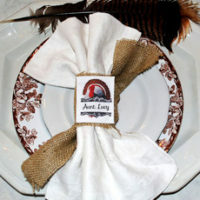 I do a lot of projects with mod podge on glass and it’s hard to find certain fabrics that my customers are looking for. I just did a mod podge test run with it and no smudging (I have an Espon XP-400). I’ll be hitting up JoAnn’s tomorrow to buy some white fabric to print on – thank you!!! Yay!! Have fun Printing on fabric Amy! We are looking in to this now for our party supplies uk site Looks easy but does it need a certain ink to become permannat? Wonderful article! Tried it with great disappointment. I get lots of black smudges. that totally ruins the layout. I just cleaned the printer so……….? I also am using Reynold’s freezer paper and found the printer did not want to take it before running it back and forth about an inch or so and that also threw off the layout. I’m just playing now, but have a project in mind and wondering if there are places you could bring a layout to and have them print it with pigment ink. Sorry you are having problems, I had to practice this method a lot before getting it to work too! Are you putting the shiny side of the freezer paper facing the fabric? You might be able to take your project to the print center of your local Office supply store like Staples or Office Depot. I’m not sure if they could help you or not but it might be worth a call. Good luck!! I tried this and my printer just feeds the fabric through and prints on the next available sheet of paper. HELP! This is great info. I am looking into starting printing t-shirts and fabrics for labels. It’s low volume so outsourcing isn’t a viable option. With your help I found a way of doing this in our storage area for minimal cost. Thanks again. My pleasure, I am so happy you found it helpful!